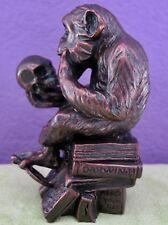 This is a small size sculpture entitled Monkey and Skull (1892) by Hugo Rheinhold. This sculpture is amazing! Have you ever wondered what the artwork looked like from behind the painting?. Or from the side?. Danaide by Rodin. Italian quality. This is one of 50 daughters of Danaus, who marry the 50 sons of Aegyptus, but are forced by their suspicious father to murder their husbands on the wedding night. 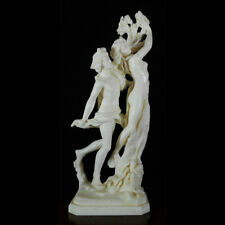 It is a very high quality Italian reproduction made of bonded marble. Two most famous compositions of lovers by Rodin (1840-1917) are "The Kiss" and "Eternal Spring". The original of The Kiss is in Le Musee Rodin, Paris. The sculpture itself is supposed to be a part of his composition The Gates of Hell. The myth says that Apollo was teasing Eros - God of Love. Eros felt humiliated by Apollo and being offended he shot one arrow, which induce love, into Apollo's heart, while the other arrow, which kills love, he shot into heart of Daphne - daughter of the river god. This is an Edgar Degas sculpture entitled "The Little Dancer of Fourteen Years Dancer" (Petite Danseuse De Quatorze Ans, 1879-1881). After this experience Degas never exhibited any of his work again. Kiss by Rodin. Large. Santini. Italy. Two most famous compositions of lovers by French sculptor Rodin (1840-1917) are "The Kiss" and "Eternal Spring". The original of The Kiss is in Le Musee Rodin, Paris. The sculpture itself is supposed to be a part of his composition The Gates of Hell. (976218)s31. Weight: 1 lb 14 oz. After the Second World War, Dali converted, by his own account, to mysticism. The beginning of the Atomic Era strongly influenced his thinking and led to a strong spiritual foundation for his paintings which he made with a great appreciation for the classic art of painting. Italian sculptor A. Santini created four Allegories: Air, Water, Fire and Earth. In our collection we have all four of them. Each Allegory have three cherubs playing with different allegorical attributes - dolphin, eagle, dragon and fruit tree.This is Allegory of Earth. Austin Productions. the Kiss 8" tall. Rene Magritte (1898-1967) was born in Lessines near Tournai in French speaking Belgium in 1898. He attended the Academie des Beaux-Arts in Brussels from 1916 to 1918. In 1919 Magritte contributed to the first issue of the review Au Volant published by the Bourgeois brothers. This is a sculpture entitled Winged Swan For Bacchanale Ballet (1939) by Salvador Dali. The ballet was set to the music of Richard Wagner, whose insane patron, king Ludwig II, was portrayed in the scenario. The elongated neck catches the eye in this portrait of Lunia Czechowska, a family friend of the Zborowskis. Modigliani is very fond of the friendly and sensitive Lunia Czechowska and he regularly paints her. This is a small size sculpture entitled The Kiss (1907) by Gustav Klimt. The powerful bond between man and woman (c. 1907) is eloquently illustrated by the renowned 20th-century artist, Gustav Klimt. After this experience Degas never exhibited any of his work again. This is an Edgar Degas sculpture entitled "The Fourteen-year-old Dancer" (Petite Danseuse De Quatorze Ans, 1879-1881). Edgar Degas' beloved sculpture of a young ballerina, is here reproduced after the original wax model. This is a very nice size Grecian Statue of a female holding a jug. There are holes in the bottom of the stand so it can be mounted on wood. His paintings show his passion for sculpting, a craft which he had to give up in 1915 due to ill health. He was born in the Tuscan town of Livorno and received his academic education in Florence and Venice. This is an Edgar Degas sculpture entitled "Danseuse Verte Green Ballerina " (Green Dancer, 1880). Both cards are in four languages. This sculpture is amazing! Have you ever wondered what the artwork looked like from behind the painting?. Austin Sculpture. These sculptures are no longer produced. This particular item is rare and hard to find! A female golfer standing and leaning against a set of golf clubs. Bronze color. Original box not available. Cherubs with Dragon represent an Allegory of fire by Italian sculptor A. Santini. He created four allegories: Air, Water, Fire and Earth. Each allegory has three cherubs playing with allegorical attributes - dolphin, eagle, dragon and fruit tree. Presently we have a huge inventory of over 500 pieces from which you may select. We are continually adding extra models to our range. Not Resin, 100% Bronze. MOQ: 1 piece. Shocked by the dropping of the atom bomb, Dali took a different mystical turning after the Second World War. He combined this new approach with a fanatical interest in the classical art of painting. Both cards are in four languages. This sculpture is amazing! Have you ever wondered what the artwork looked like from behind the painting?. Or from the side?. Salvador Dali Portrait of Picasso Sculpture Art Figure NEW! 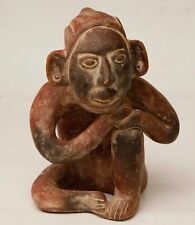 This piece is from the Tumbas de Tiro (Shaft Tombs)culture, originating from Lagunillas in the state of Nayarit. 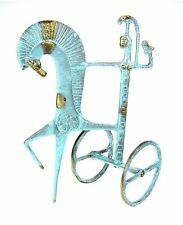 not sure if this piece is believed to be ancient, however it is probably an excellent reproduction that is about 40-50 years old. Cherubs with Dolphin represent an Allegory of water by Italian sculptor A. Santini. He created four allegories: Air, Water, Fire and Earth. Each allegory has three cherubs playing with allegorical attributes - dolphin, eagle, dragon and fruit tree. This Italian angel is a wall decoration. It is made of bonded marble and is 12" long. Very cute. This Italian angel-girl is a wall decoration. It is made of bonded marble and is 12" long. Signed by A.Santini. Very cute. You better buy them together because they are very much in love and would feel lonely if separated. Allegory of Air. Cherubs with Eagle by A. Santini. Italy. Cherubs with Eagle represent an Allegory of Air by Italian sculptor A. Santini. He created four allegories: Air, Water, Fire and Earth. Each allegory has three cherubs playing with allegorical attributes - dolphin, eagle, dragon and fruit tree. This is an Edgar Degas sculpture entitled " L’ATTENTE" The Waiting Ballerina " ( The Waiting Ballerina, 1882). Both cards are in four languages. This sculpture is amazing! Have you ever wondered what the artwork looked like from behind the painting?. As it's know, they are still made using the original handmade painting technique, and molded in the traditional clay ovens. You may also find Pucara Bulls painted in brighter colors with typically Andean designs. THE TREE IS PLANTED ON A TAIWAN JADE POT, FILLED WITH HAN-WHITE JADE. ITS LEAVES ARE MADE OF TAIWAN JADE. THIS FLOWER IS ALSO ADJUSTABLE TO FIT YOUR CABINET, SHELF OR TABLE. YOU MAY BEND THE BRANCH OVER TO MAKE IT THE WAY YOU LIKE. 'ALVA MUSEUM REPLICA'. No real condition issues to report. The sculpture itself has a few lighter spots on its surface which are barely noticeable from any appreciable distance. The abstract form of the mother and child doesn't suffer from any unsightly dings, deep abrasions, fractures, flea-bites, repairs or unsightly stains. Pucara Bull Good vibes.. Shipped with USPS Priority Mail. Legends Sculpture "DEFENDING THE PEOPLE" by C. Pardell 1992 ~ LE 82/950 ~ Mint! Designer: C. A. Pardell. "DEFENDING THE PEOPLE". This fine art sculpture is a Signed, Certified Limited Edition of 950 -- limited to only 950 pieces. This is Limited Edition #82 of 950. Sculpture is mounted on a black marble base. Item may be missing a piece which maybe was a arrow. Corners have some wear like the finish is coming off. In good shape. Item weighs close to 3 lbs 11 oz. Animals could be wolf but look more like coyote. 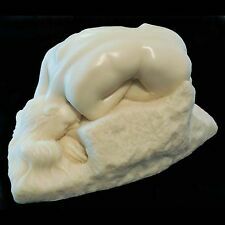 This beautiful piece of art is hand carved from multi jades. It is in red, yellow, white and green colors. The branches can be bent over to be the shape you like. SIZE: 22" X 12" X 15". Pucara Bull Good vibes.One Piece.